As a P2PE-certified key injection organization and a key holder for more than 170 processor and acquirer keys, including Chase, Elavon, First Data, Global, TSYS and Worldpay (Vantiv), POSDATA can deliver technology fully configured and ready to go. Our state-of-the-art key injection facility adheres to strict industry standard rules regarding security procedures, rigorous audits and internal upgrades. 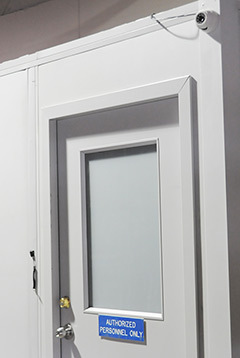 From the receipt of key components through the key injection process, a secure facility is maintained to protect devices and sensitive equipment 24/7 with access door control, camera surveillance and limited personnel access. With a constantly changing financial transaction industry, it is imperative that our staff stays actively involved with respected organizations including ISO and ANSI to develop and understand the standards related to the security of financial transactions. Our dedicated encryption services staff, committed to being industry proficient for our reseller partners, continually attend Visa/Master Card required training on their requirements for compliant facilities. From injection to end-of-life, POSDATA’s serial number tracking minimizes security risks and maintains a comprehensive audit trail. Furnished with each shipment is a detailed report for each device with itemized data including serial numbers. Visit our PCI Security Center for information and resources about payment security.